Auto-Owners Insurance is pleased to announce the Harrod Insurance Agency, Inc., 12038 Owl Creek Rd., Wapakoneta, Ohio, has been named one of the Top 10 growth agencies for the Company in the state of Ohio for 2012. The agency was recognized at a luncheon meeting in Lima, and at a reception with all regional associates, where they and other recipients were presented with a plaque commemorating their accomplishment. Harrod Insurance Agency has represented Auto-Owners since 2011. 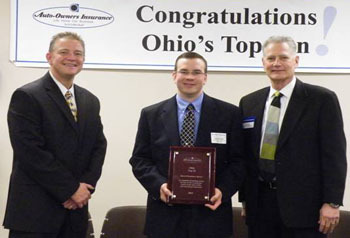 Auto-Owners Insurance was founded in 1916 and has served Ohio since 1936. Auto-Owners Insurance is a Fortune 500 company and is the 18th largest property/casualty insurance company in the nation, based on written premium. Auto-Owners Insurance Group is one of only nine groups of insurance companies in the United States to receive the highest rating possible, A++ Superior, by A.M. Best, which is a nationally recognized rating agency for insurance companies. Auto-Owners has received the J.D. Power and Associates award for the “Highest in Customer Satisfaction with the Auto Insurance Claims Experience,” five years in a row, for 2008 - 2012. Auto-Owners is headquartered in Lansing, Michigan, and serves policyholders in 26 states. Auto-Owners Insurance is proud to be recognized by J.D. Power and Associates as “Highest in Customer Satisfaction with the Auto Insurance Claims Experience” for the fourth year in a row. The company received this recognition in 2008, 2009, 2010 and again for 2011.